The opulent and decorative architecture of the Bode Museum makes it feel like you are viewing the collection in its natural habitat. Originally named the Kaiser Friedrich Museum when it was completed in 1904, the Bode museum was renamed in 1956 for the former general director of the museum, Wilhelm von Bode. Ernst von Ihne, the state building officer who designed the museum created an impressive stately edifice that seems to rise out of the river Spree, itself a work of art. Wilhelm von Bode, had a hand in designing the exhibition spaces and conceived of a space where elaborate staircases, fireplaces, windows and furniture all work together with the artworks to give a general sense of authenticity. During the Second World War, along with the other buildings on Museum Island, the Bode Museum suffered damage and from 1950 was slowly reconstructed. In 2006, with restoration work completed in its entirety, the museum was returned to full service. 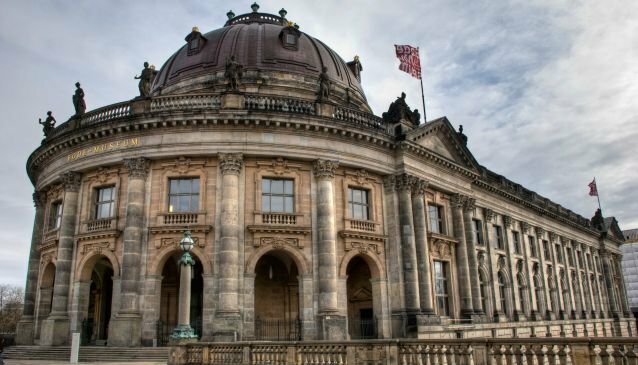 The Bode Museum, true to the philosophy of its founding director, mixes art collections and currently houses the Sculpture Collection and the Museum for Byzantine Art, and The Münzekabinett (The Numanistic Collection) where there is one of the most significant collectons of coins and medals in the world.